I have added the recipe below! When visiting a friends house, she served the best Sweet Pickles. I was sure the pickles had cloves in them. I searched and searched for a recipe but didn't have any luck. One day a friend of mine was visiting and I told her about these delicious pickles. She said "Joan, I have a great recipe for sweet pickles and they have cloves in them." So, I made two batches and enjoyed them all winter. stamp was perfect for my jar of Sweet Pickles. I hope to have time to do some beans too before we leave. I love what Kellie Fortin from JustRite did to introduce this new stamp set and I decide to use her idea as my starting point. Great job Kellie! I stamped the image, colored it with my Copic markers, cut and embossed it with the scalloped Nesties, added a darker border to set off the image. After cutting two coordinating strips of paper, I used my Martha Stewart punches on both ends to decorate the jar. The strips were then attached to the jar, along with the image that I popped up with some dimensionals. I stamped the same image again, except I removed the outer circle. This is one thing I love about the JustRite stamps, they are so versatileand interchangeable. I applied this image under the canning jar ring and screwed it on tight. Then I glued a piece of green gingham ribbon all the way around the ring and used the Bow Easy to make a double bow. There won't be a sale posted tonight, because I will be leaving Wednesday for the UP in Michigan. But, I will be back for the posting on the 10th of August. Hopefully all the JustRite and Flower Soft things will be in by then so I can get them shipped off to you. The Fall Harvest and Thinking of you are on back order, so I am waiting for them. Place cucumbers in a stone jar, glass or enameled container. Combine salt and 1 gallon water. Bring to boil and pour over cucumbers. Cover with a plate and weight down. Brine must cover pickles. Keep stirring water every day to prevent mold. If mode exists at the end of 8 days, rinse well. It will not hurt the pickles. Let pickles set until the 8th day and on the 8th rinse well and cut in to either slices or chunks. I chunk mine. Return to container. Mix up 1 gallon water and 1 T powdered alum and bring to boil. Pour over pickles. Repeat this 4 times. On the 12th day drain and rinse pickles. Combine sugar, vinegar and celery seed and bring to a boil. At this time I add a few drops of green food coloring to give the pickles a nice fresh look. Repeat this for 2 more days. Looks absolutely lovely! I am sure whoever gets these offerings will be delighted. I am sure all of your readers would love to have a good recipe for the pickles!! Hint!! This is gorgeous, Joan and I bet those pickles are fabulous! I love your mix of papers around the jar with the sweet border, and that gingham ribbon is YUMMY! Just darling, Joan! Love it! Love how your jar turned out. Oh my gosh Joan, this is so adorable girl! I love it! Oh my gosh, I can just imagine the face of the recipient, what a fabulous special touch! AWESOME!!! It's just like you to come up with a BEAUTIFULLY adorned jar of pickles! Bet that recipe is yummy!! Your friend is going to be thrilled ... not only with your company but the yummy goodies you'll be bring along!! You are certainly the "hostess with the mostess" in my book!!! Have a safe trip and a wonderful time!! Can't wait to hear all about it!! Joan - how wonderful... I just love pickles... Any kind... This is so sweet of you!! 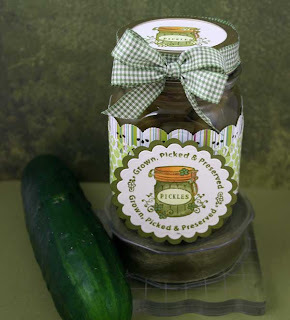 Great sounding pickle recipie Joan and of course I love the way you dressed up your jar!! What a cute idea. Bet the pickles are delicious. I left you an award. Check it out on my blog.